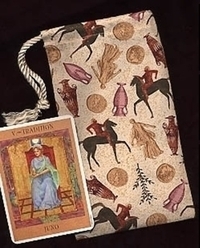 Wide Tarot Bags - Mythology Wide Tarot Bag - Tarot Bags, Tarot Cards, Cloths, & More! 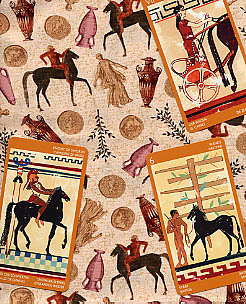 Here is a fabric that pays tribute to some of the ancient cultures of the Mediterranean. Details from classical statuary, architecture, pottery, and other artifacts provide the inspiration for the illustrations that spread across this fabric to make it the perfect home for a special deck. 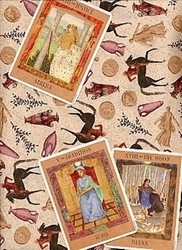 Notice what a beautiful match it is for the Goddess Tarot. The Wide size is perfect for the Mythic Oracle of the Ancient Greek Pantheon and there is even room for the guidebook. 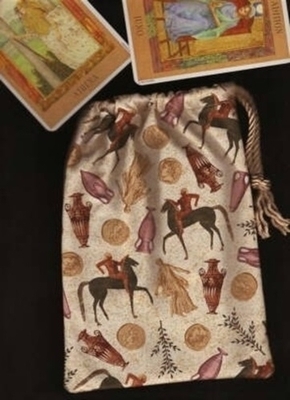 The goddess statue on the fabric is a wonderful coordination with several of the cards from the divination deck titled Ancient Feminine Wisdom of Goddesses and Heroines. This size of bag will house the carton, LWB, and the 52 card deck all together. Wide: Fits oversided decks or regular size decks with other items. Matching spread cloths in two sizes are available from our Spread Cloth collection: Classical World cloth.